The 43-year-old qualified for tomorrow’s KL3 canoe final. O'Leary in action in Rio earlier. PAT O’LEARY, the NUIG lecturer who had his leg amputated after battling bone cancer, has made Irish Paralympic history this afternoon by qualifying for the KL3 canoeing event final. The Cork native progressed through to Thursday’s medal race after third-place finishes in his heat and then semi-final at Lagoa Stadium. O’Leary, competing in his first Paralympics as canoeing is making its debut at the Games, said clocked a time of 45.97 in his heat and, within an hour, went even faster to book his place in the final. He started well by finishing third in his heat, in a time of 45.97 seconds, and, within an hour, went even faster when finishing third in the semi-final in 44.13 to clinch his spot in the final. “It feels absolutely brilliant,” he said. “I was coming in ranked seventh and if I hadn’t made a final I would have been really disappointed even though there’s eight places in the final but the guys out there really threw it up to us and the guys behind me were in my sights all the way. “It was a bit hard to race twice in such a short time, normally we’d do heats in the morning and the semi-finals in the evening and final the following day, but because it’s a compressed programme we only had an hour. “It does tire you out but we would do it 20 minutes apart in training so we were prepared for it,” he added. “It’s great to get through and I’ll get a good rest now and we’ll see what tomorrow brings. The 43-year-old lost his leg five years ago and after taking up para-canoeing has qualified for six finals at World and European Championship level. For the second successive day, temperatures reached mid-thirties in Rio but O’Leary managed to cope with the stifling conditions. “The factor 60 is great for me,” he joked. “I traditionally wear a bandana on my head but I couldn’t get the bandana past the apparel police so I’ve had to wear a baseball hat backwards on my head which is not my normal look but there you go. 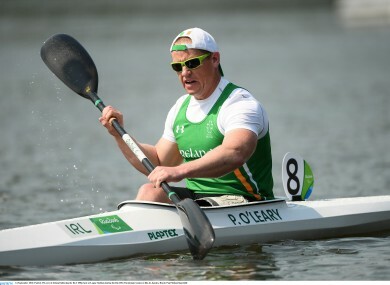 Email “Cork's Pat O'Leary makes Paralympic history on the Rio water ”. Feedback on “Cork's Pat O'Leary makes Paralympic history on the Rio water ”.